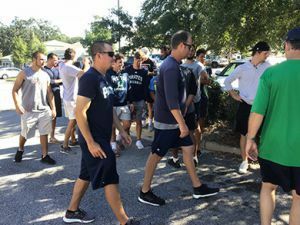 Pensacola State employees and students, along with the Pirates Baseball team, volunteered at the Ronald McDonald House on Friday, Oct. 5, during the United Way of Escambia County Day of Caring. 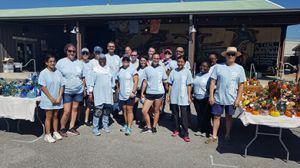 Pensacola State volunteers removed 48 old beds and installed new beds in 26 guest rooms at the facility that provides a home away from home for families who travel to Pensacola to receive critical medical care for their children. 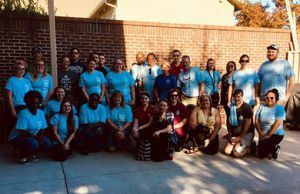 A second group from Pensacola State volunteered at First City Art Center to assist with setting up the Pumpkin Patch Party. The volunteers helped landscape the facility and set up tables with over 1,000 blown glass pumpkins for the center’s largest fundraiser of the year.